This morning I was let loose with 30 kids doing some centre-based and forest orienteering. Very challenging to entertain, enthuse, capture attention, set-off, mark answers, and count in the kids, but nevertheless great fun (and they were well behaved)! 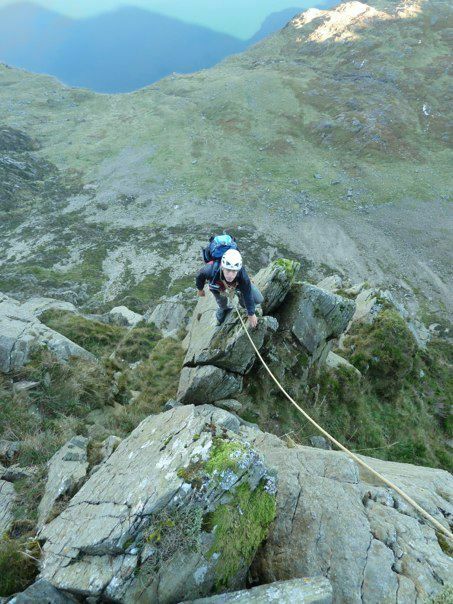 In the afternoon I joined in with some staff training on the abseil tower and in the climbing wall, and in the evening had a personal training session on the ski slope. I’d promised Glyn that I’d go out with him so he could revise SPA stuff for his assessment later in the week (which he passed, woot!). After a short while at Lion Rocks, where we also met Lou with her group, we dived into Llanberis for a mug of hot chocolate in Pete’s! 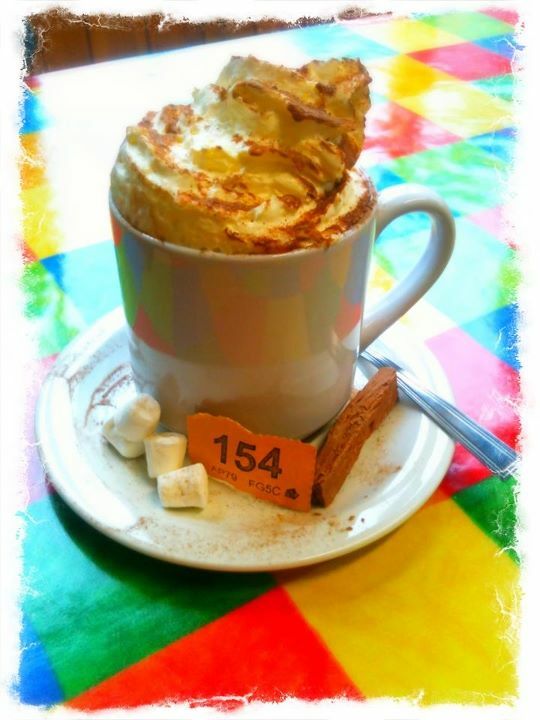 Pete's Eats large hot chocolate with cream & marshmallows! This morning I drove over to Chevron Driver Training to be assessed for ability in the run up to some training for acquiring my D1. This went well, and I must now do the 8 hours and test over 3 days at the end of the month! On the way back, a cheeky stop at Tesco for some wine/chocolate. Not wishing to neglect the shiny road bike, I introduced it to another area of the park today down via Beddgelert and back round on the A5. On the way past Craflwyn I bumped into Rob Samuel and we had a good chat and promised to meet up on the weekend for a mountain run! The ride ended up as 2hrs 25mins, 41miles at an average of 17mph with 1000m ascent! That evening, a cheese & wine party rave in the CA house! A work day, preparing for directing a weekend’s orienteering course in a fortnight. Oh, and I bought a CO2 pump for the bike, it’s tiny! Bilberry Terrace has been on the cards for a while now. Ever since reading Scrambles in Snowdonia (Steve Ashton) for the first time C.4 years ago, I’ve regarded Bilberry to be ‘the ultimate’ in grade 3 scrambling. A glorious day presented itself in Snowdonia, very much the last (but brilliant) opportunity to make a decent summer outing for a scramble. After a slightly delayed start (Tom slept through his alarm! ), we parked at Lockwood’s Lake, and made our way up the new Pen y Gwyrd – Pen y Pass path (oddly muddy in parts yet a nicer alternative to the road). A short walk in up the Miner’s Track and on to the foot of Lliwedd – already pausing to take in the immense scale of the North Face. 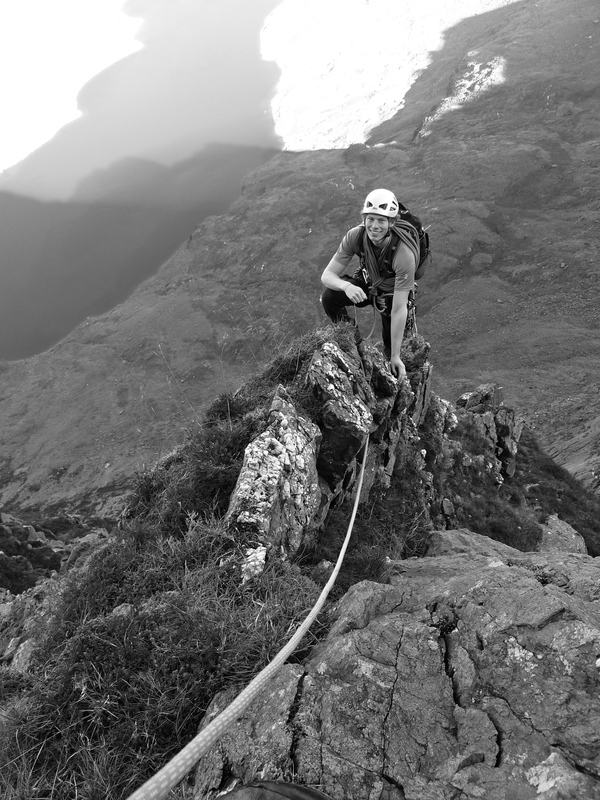 The route finding is somewhat more demanding on the next section, yet not difficult – just a little awkward. We found our way past – excitingly – a handful of bilberries (surviving later in the season up here than their counterparts elsewhere) to the next spike. Heading on over stunningly exposed rock ribs, using running belays and moving together, made for a quick traverse back for 80ft or so. 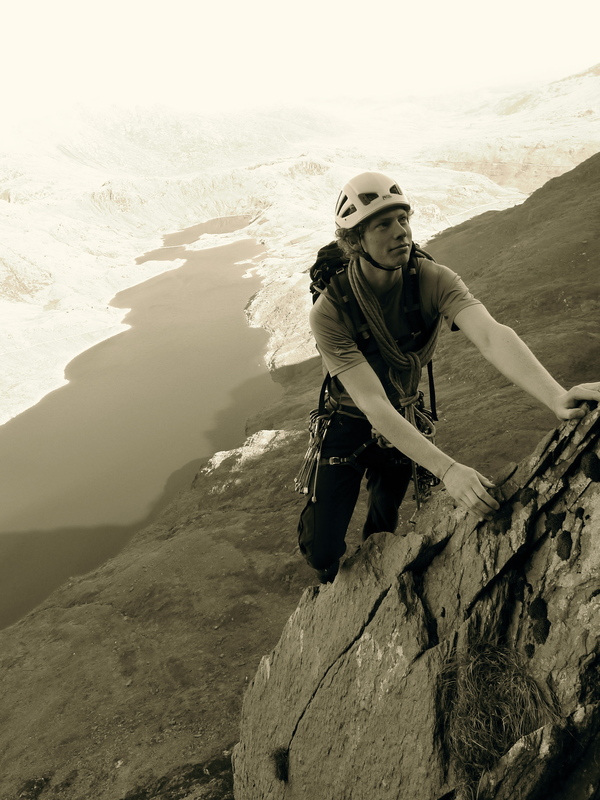 Nearer the top, some funky 3D climbing and a final mini-arête led us out beautifully onto the very summit of the West Peak, Lliwedd. Only 2.5 hours on, this made perfect time for a spot of lunch, before Tom suggested a quick dash up the south screes, over Snowdon summit and back round over Crib y Ddysgl and Crib Goch. On the way down we came across the team from Warrington again who had taken a little longer on the face. Our circuit meant a lovely end to the day, gaining maximum time on the rock, all in good time for me to get back for a 6pm Bar shift at Plas y Brenin! 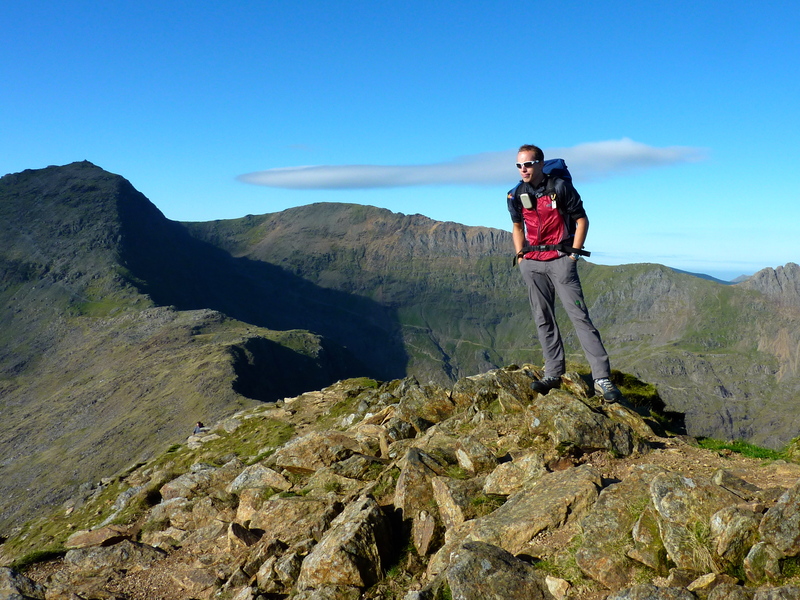 Busy weekend – today Rob Samuel and I set our sights on a scramble-run from Gerlan up Cwm Llafar, up Crib Lem, over Dafydd and Llewellyn, and down via Pen yr Helgi Du to Capel Curig – 1180m ascent, 2hrs 40 mins at a leisurely pace. Most pleasant and great to be out running the mountains with Rob again, although I’m not sure I’ll ever be able to keep up with a GB Mountain Running Team member uphill :s! Tried out the new Salomon Fellcross on this run, it’s a really good running shoe off the beaten track, but don’t rely on it over anything too rocky!